Above: left & right side panels. Right: back & top. IF YOU ALREADY OWN A ROLAND R-05 YOU MAY STILL PURCHASE SOME OF ITS ACCESSORIES FROM OUR R-05 WEBSHOP BELOW. The eagle-eyed amongst you will possibly have noticed some similarities between this Roland recorder and Edirol's classic (but now discontinued) R-09HR. You are not wrong. Edirol used to be part of the more music-market orientated Roland Corporation. The Roland R-05 is loosely derived from the Edirol R-09HR but do not consider it to be an R-09HR with a cheaper price tag. It isn't. It costs less because it is a down-specified version. So if you are looking for an equivalent recorder to the old R-09HR then you should be looking at the Sony PCM-M10. However if you are looking for a more affordable compact recorder with reasonable performance and facilities then the R-05 is certainly worth a thought. It even includes some of the useful features of the R-09HR - 24/96 capture, basic editing features, and extended battery life. So for capturing your recordings on stage, in rehearsal, at school, or whenever inspiration strikes and without breaking the bank, the R-05 will serve you pretty well. The R-05 provides uncompressed stereo recording directly to SD card up to 24-bit/96kHz resolution. Whether recording directly with the built-in stereo mic or capturing sounds from an externally connected microphone or stereo line input, you’ll be impressed with the R-05’s detail and clarity. And for worry-free recording, the convenient Rehearsal mode ensures that you won’t overload the input. Even though the R-05 integrates fluidly with computers via USB 2.0, this new generation recorder doesn’t require a PC for simple editing. For speed and convenience, you can trim, divide, and combine within the R-05. And for those who’d like to apply a high-gloss finish to their recordings, the R-05 is equipped with built-in reverb. In a rehearsal studio, you can make clear recordings of your band, even at high volume levels. The R-05 can automatically set the optimum recording level, and can split the songs for you automatically. It’s also possible simultaneously to record a high-quality WAV file for CD production and an MP3 file for file sharing. The R-05 can help you practise your instrument or vocals. You can repeatedly loop a specified region of audio, or change the playback speed without changing the pitch. You can play back a difficult phrase slowly or play back at high speed to grasp the overall structure of a song in a short time. 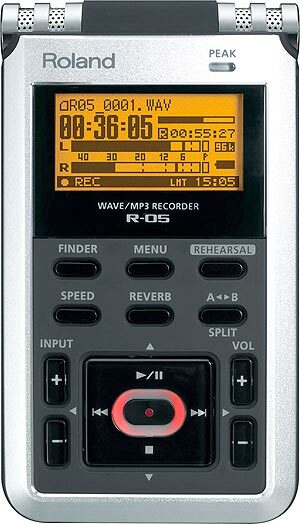 Musicians will naturally gravitate to the R-05, but this portable recorder is also acceptable for many non-musical applications as well e.g. 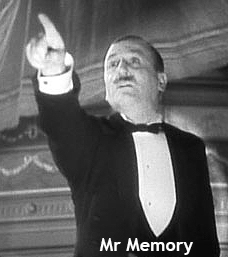 recording lectures, speeches, and meetings. The included windscreen and tripod mount enhance optimal placement and cleaner recordings as well. To enhance and extend your R-05's capabilities we offer several optional accessories in our webshop section below, including headphones, external stereo microphones, a microphone stand adaptor, a cover/windscreen set, silicone rubber case and carrying pouch.